Tattoos, rock bands, fast cars and the endless possibilities of metal. These are a few of the interests shared by this group of young entrepreneurs, each of whom have begun their own fabrication companies in the face of job changes and health problems, never mind the uncertainty that plagues anyone who’s cut the corporate rope to follow their dreams. Known simply as Boonie, he set aside a career in journalism after a pulmonary embolism nearly took his life. Today, he and his wife own Factor Fabrication, a successful architectural and furniture fabricating business. 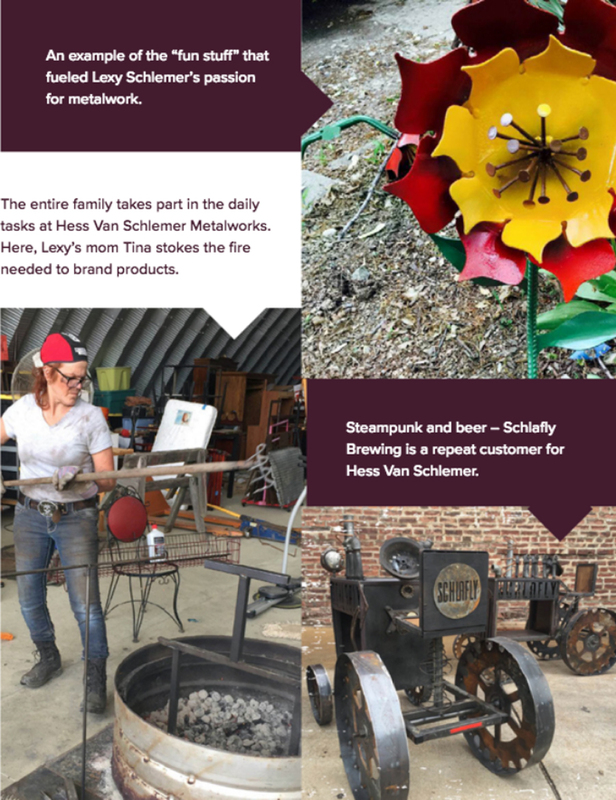 Alexis Schlemer, the young woman gracing the cover of this issue, left her job as a paralegal to open Hess Van Schlemer Metalworks, an eclectic mix of steampunk, flowers and family. Jordan Dickinson pursued his passion for hotrods and vintage motorcycles to open his own shop. 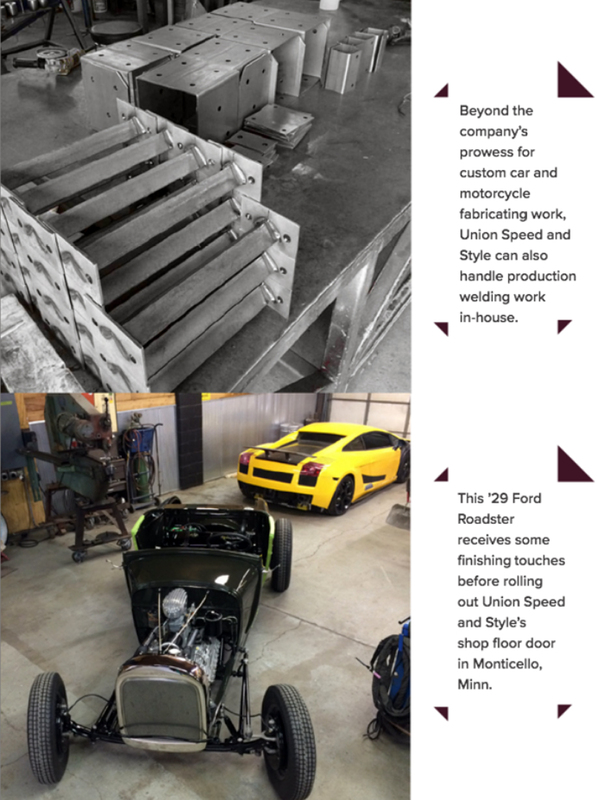 Union Speed and Style provides custom parts, custom upholstery work, specialized fabrication and more, and recently won a national competition. These three have set aside the status quo for something more. Their stories speak volumes about the human spirit and the determination that so many of our readers have in common. Please join us in wishing them the best of luck going forward. 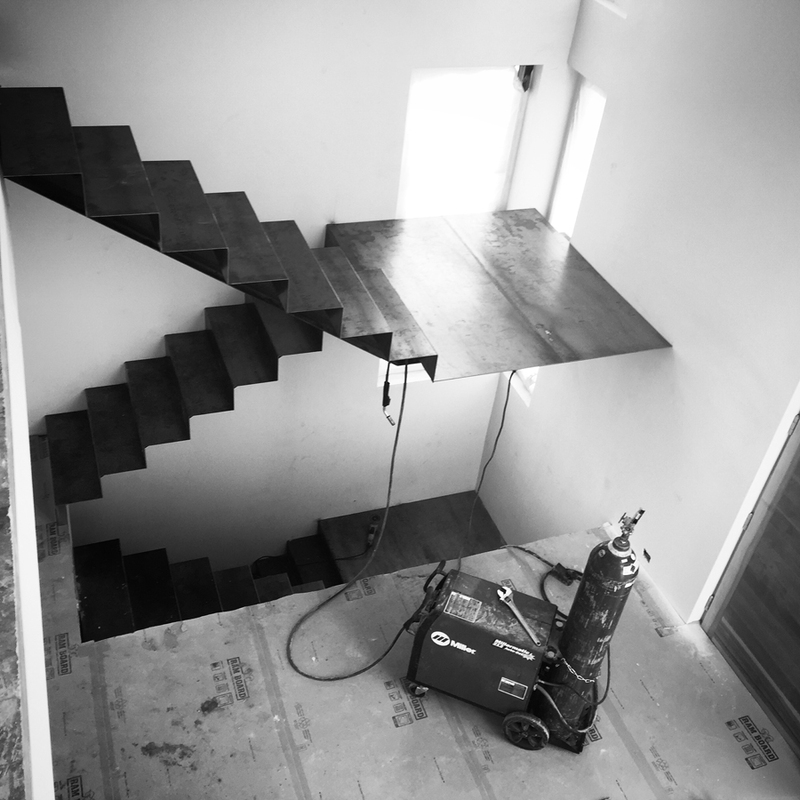 Design and fabrication of custom architectural work is one of Factor Fabrication’s specialties. If it hadn’t been for Boonie’s near-death experience in 2008, none if it would have happened. Boonie began in the mechanical department at Iowa State University’s Memorial Union while pursuing his degree in journalism. After graduation, he took a job with a Des Moines fabrication company, but remained in touch with his colleagues and was speaking with one of them when he had a pulmonary embolism. It turned out Boonie has Prothrombin G20210A (Factor II), a rare blood disorder that increases his risk of blood clotting. He was resuscitated and then airlifted to a Des Moines hospital where he made a full recovery after a few nail-biting days in intensive care. He’s since been prescribed blood thinners and lives a normal life, in spite of his genetic condition. This medical emergency wasn’t Boonie’s only life-altering event. As bass player for the rock band “Why Make Clocks,” he made several tours of the United States with one gig landing him on the Gulf Coast a week after Hurricane Katrina. 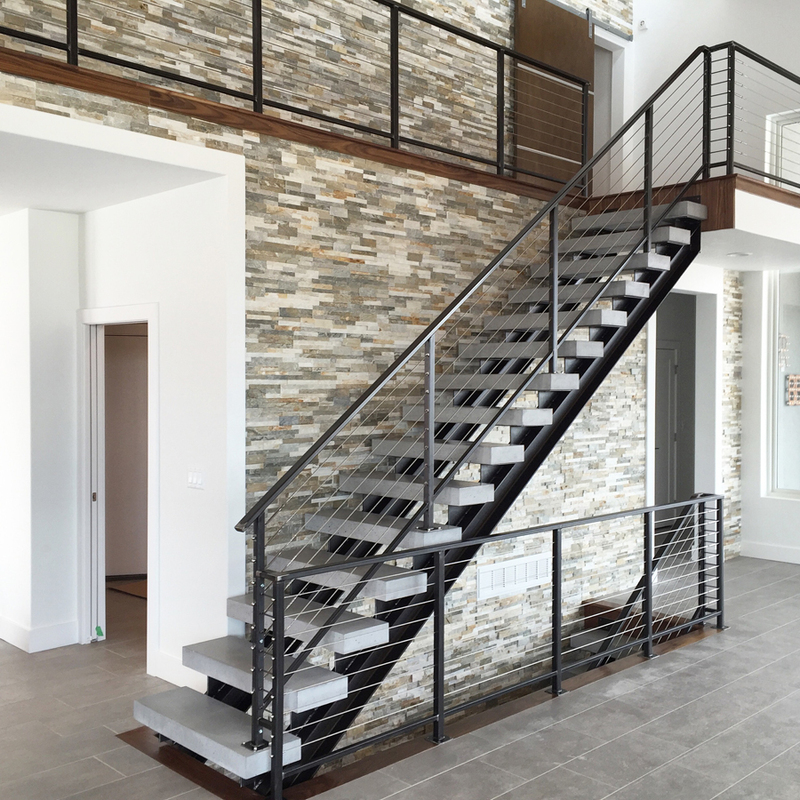 Factor Fabrication fabricates and installs a variety of residential and industrial structures. Soon after his return from the hospital, Boonie quit his job to pursue a dream he never knew he had. Having gained several years of experience within various trades at the university, Boonie was well-equipped with the necessary skills. Unfortunately, the economy crashed shortly after he announced his self-employment. Factor Fabrication spent the next two years scraping by with Boonie wondering if he’d made a terrible mistake. Happily, that’s not the case. He and his wife hung on and eventually prospered. Today, their company has four full-time employees and 8,000 sq. ft. of fabricating space. Boonie says there’s nothing fancy about his equipment – saws and welders, mostly, with the powder coating and profile cutting subcontracted out to local shops – but that doesn’t stop him and his team from making some very special products. Factor Fabrication just announced its own line of furniture and is busy with a variety of architectural projects for homeowners and businesses alike. 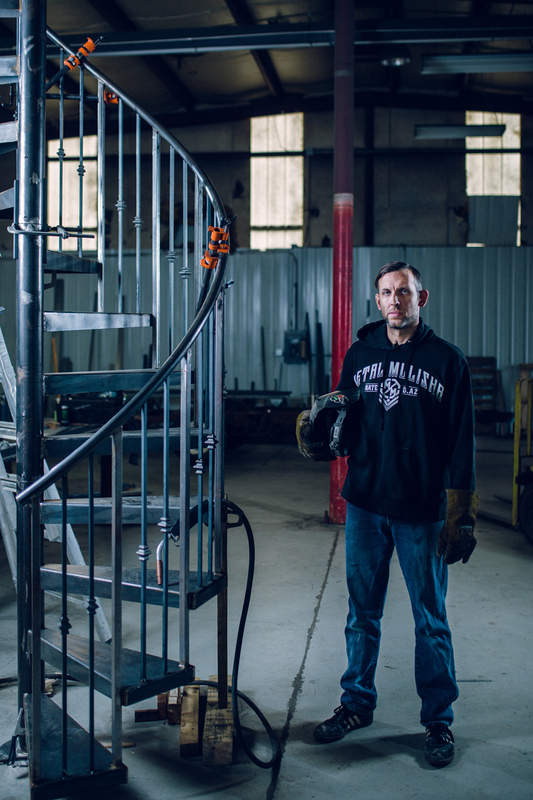 Lucky to be here, Boonie stands alongside one of his recently fabricated spiral staircases. And if you’re wondering about the company name, it’s a result of Boonie’s blood disorder, Factor 20210, a snippet of genetic material that nearly took his life, then paid it back to him, in spades. Alexis Schlemer has been serious about metal since her late teens, when a passion for steampunk and junk art evolved into something more. With the support and frequent participation of her father, she took classes on stick welding and began augmenting her career as a paralegal with sales of decorative metal flowers and “other fun stuff” out of her garage in Edwardsville, Ill. 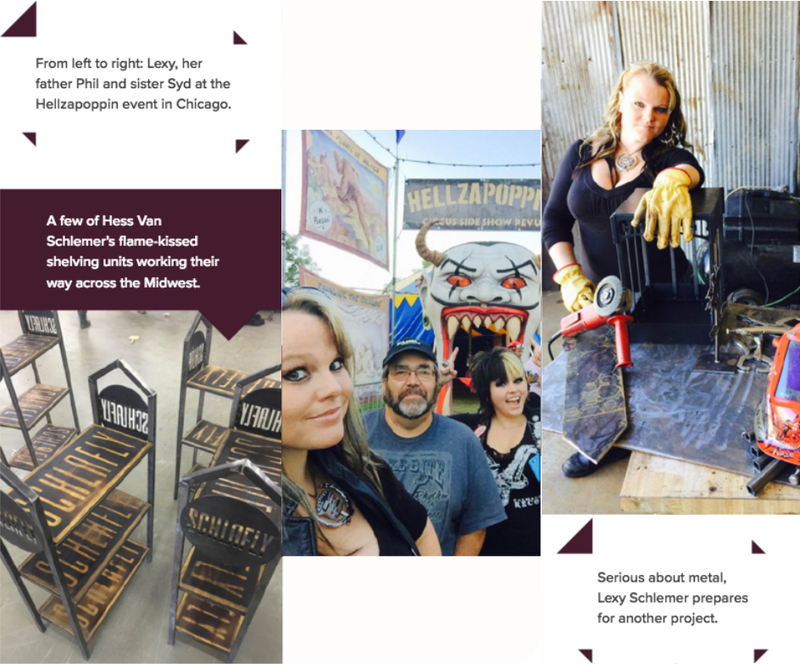 Known by friends and family as Lexy, her part-time welding and design company Drop Dead Red got its first big break when Saint Louis Brewery LLC, maker of Schlafly Beer, commissioned her to fabricate a large fire pit for its taproom. It turned out to be the first of many such projects for the brewing company. She’s not alone. Lexy and her sister Syd had long been involved with their parents Phil and Tina’s auction company, so when Lexy’s burgeoning business venture began to take off, she invited the entire family to be part of it. She changed the business name to Hess Van Schlemer Metalworks, Art & Designs, purchased a Koike PNC-12 Extreme CNC oxy-fuel cutter and put paralegal work behind her forever. “Everybody was looking for a change of pace and wanted to do something more interesting, so I suggested we should all just join forces and do this,” Schlemer says. It’s not all about work, however. In the Schlemer’s case, the family that fabs together also plays together. Their “rockametalbluesabilly” band Candy Coated Evil has been performing at local clubs and bars since 2004, with Lexy playing guitar, Syd on bass, their father as drummer and all on vocals. Schlemer likes to call them the Evil Partridge Family. Overall, Schlemer is very happy with how things are going. “We keep getting bigger and bigger clients, and we hope over the next few years to bring on some full-time employees and increase our output and our capabilities. We’re thinking about a waterjet at some point, but that depends on what comes down the pipe. Until then, it’s really great to work with my family and fun to show off our talents. We’re definitely headed in the right direction. As youngsters, many of us in the trades tinkered with our cars, bolting on barely-legal exhausts or jacking up the rear suspension, perhaps adding some mag wheels and big, fat tires. Years later, we reminisce over the rumble of those loud pipes, the smell of burning rubber. For a lucky few, however, these teenage pursuits become a career and then a business, eventually earning them international recognition for their craft. Jordan Dickinson is one of the few. The Minnesota native has had a love for old cars and motorcycles since high school, when he took his first job at a hot rod shop near his hometown of Monticello. After graduating, he attended St. Cloud Community College for collision refinishing, then went on to Wyoming Technical Institute in Laramie for several automotive specialty programs, such as chassis design, high-performance powertrains, sheet metal fabrication and upholstery. Dickinson came home, worked at a few spots, but soon decided he wanted something more. He began working for himself in 2004 and hasn’t looked back. Taking inspiration from vintage Harley Davidson and the graceful lines of pre-war automobiles, this now 30-something has made a name for himself as a metal fabricating artist among his fellow bike and car enthusiasts. Today, he and his brother Jesse operate Union Speed and Style Co., located just a few hundred feet from the Mississippi River in Monticello. Walk into the shop on any given day and you might see a 1951 Chevy Coupe, 1932 Tudor Sedan or 1929 Ford Roadster receiving a new chassis or some much-needed sheet metal work. Union Speed and Style’s equipment list is extensive but fairly basic. The company has bandsaws, welders, shears, a mill and lathe, a finger-pinching English wheel and Dickinson’s favorite, the Pullmax, a universal shearing and forming machine that allows him and his team to duplicate the body lines found in the sheet metal of classic cars. There’s also a frame table, built from a 2,000-lb. chunk of scrap iron found in a friend’s back yard and hauled two hours home in the back of Dickinson’s S10 pickup truck. The Union Speed team has been invited to display its wares across the country, from the Born-Free 6 Motor Cycle Show at Oak Canyon Ranch in California to the Hunnert Car Pile-Up in Decatur, Ill. 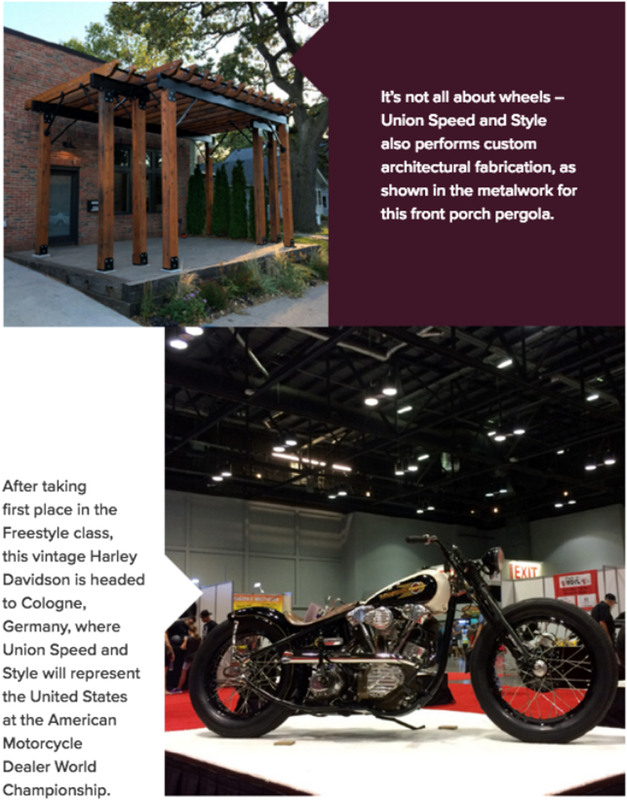 The most recent exhibition was the American International Motorcycle Expo (AIMExpo) in Orlando, where it took first place in the Freestyle class. The team is now headed to Cologne, Germany, to represent the United States at the 2018 American Motorcycle Dealer World Championship of Custom Bike Building. Union Speed and Style Co.